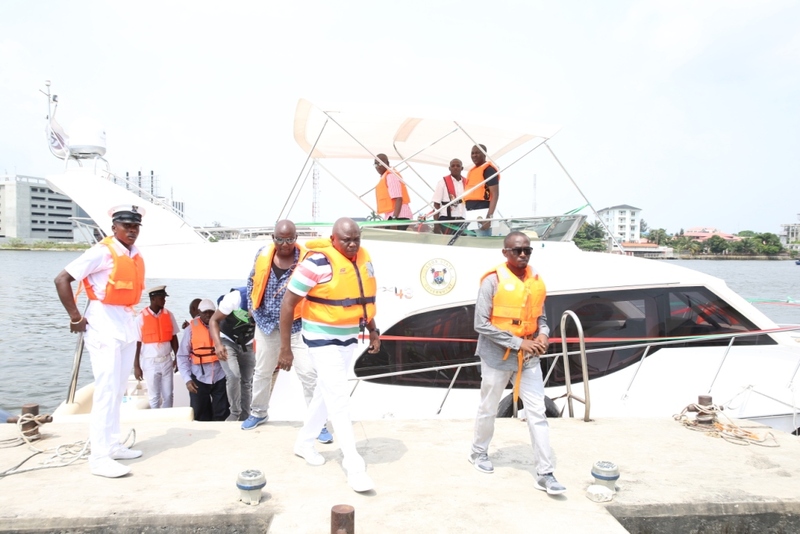 Lagos State Governor, Mr. Akinwunmi Ambode (middle), exiting from one of the new Executive Boats acquired by the State Government shortly after the commissioning at the Caverton Jetty, Victoria Island, Lagos, on Sunday, November 5, 2017. 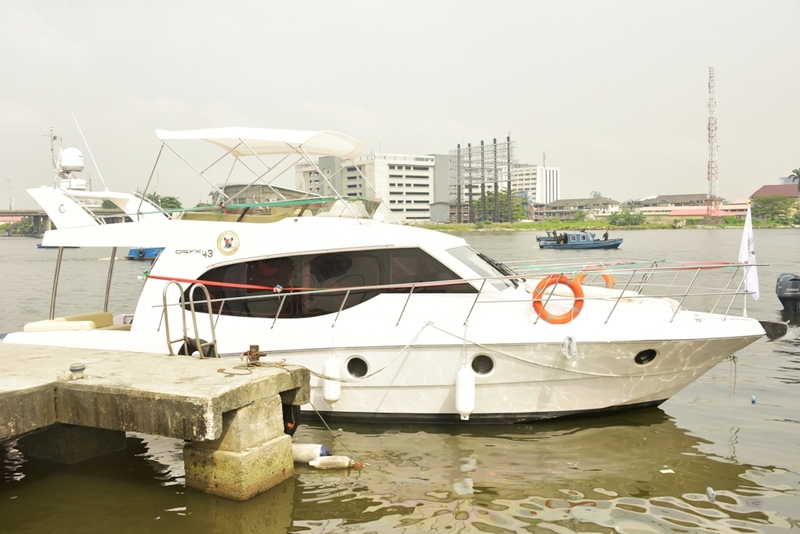 Newly commissioned Executive Boats by the Lagos State Government at the Caverton Jetty, Victoria Island, Lagos, on Sunday, November 5, 2017. Lagos State Governor, Mr. Akinwunmi Ambode (3rd left); Special Adviser on Sports, Mr. Deji Tinubu (2nd left); Special Adviser on Finance & Audit Control, Mr. Adeniji Popoola (left); Commissioner for Water Infrastructure Development, Engr. 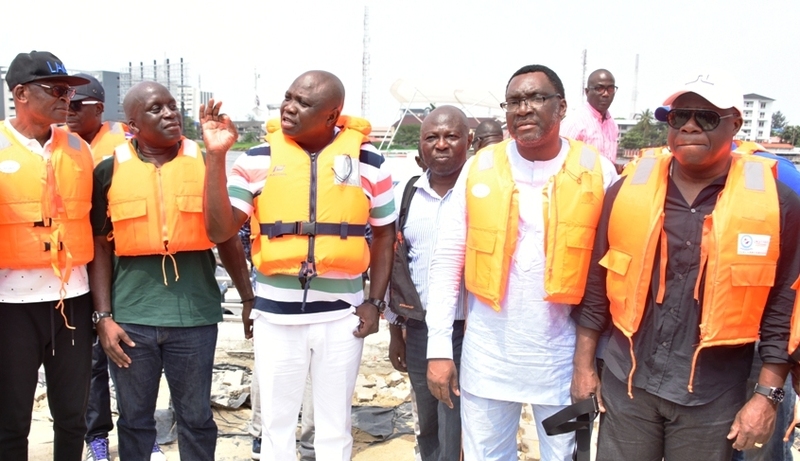 Ade Akinsanya (3rd right); his counterpart for Information & Strategy, Mr. Steve Ayorinde (2nd right) and Attorney General & Commissioner for Justice, Mr. Adeniji Kazeem (right) during the commissioning of new Executive Boats acquired by the Lagos State Government at the Caverton Jetty, Victoria Island, Lagos, on Sunday, November 5, 2017. 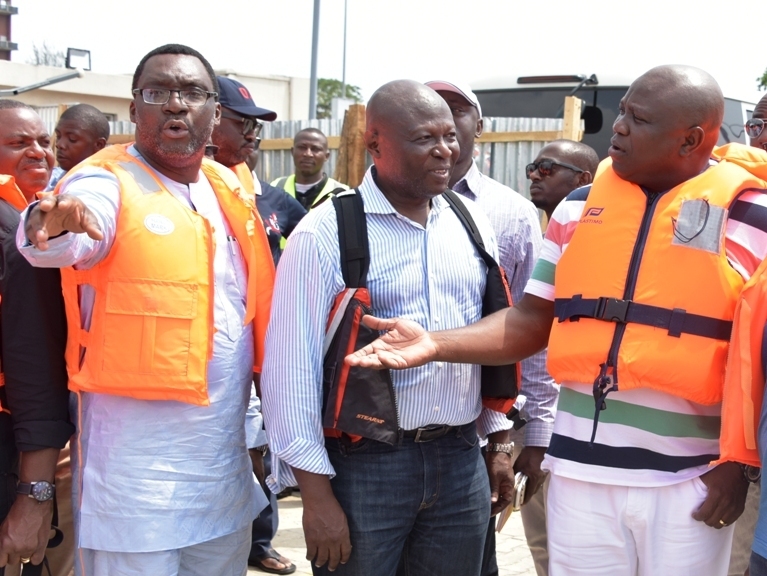 Lagos State Governor, Mr. Akinwunmi Ambode (right); Commissioner for Water Infrastructure Development, Engr. 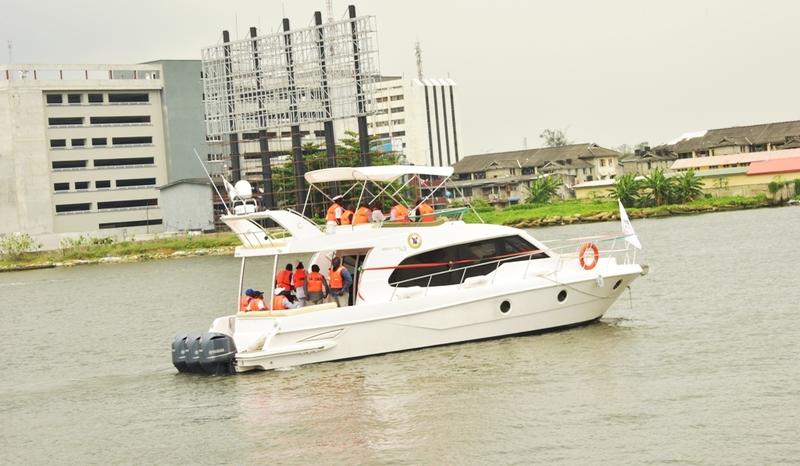 Ade Akinsanya (middle) and Commissioner for Information & Strategy, Mr. Steve Ayorinde (left) during the commissioning of new Executive Boats acquired by the Lagos State Government at the Caverton Jetty, Victoria Island, Lagos, on Sunday, November 5, 2017. 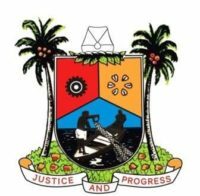 Lagos State Governor, Mr. Akinwunmi Ambode; Commissioner for Water Infrastructure Development, Engr. Ade Akinsanya; his counterpart for Information & Strategy, Mr. Steve Ayorinde; Attorney General & Commissioner for Justice, Mr. Adeniji Kazeem; Managing Director, Lagos State Waterways Authority (LASWA), Mr. Damilola Emmanuel and Special Adviser to the Governor on Urban Development, Mrs. Yetunde Onabule during the commissioning of new Executive Boats acquired by the Lagos State Government at the Caverton Jetty, Victoria Island, Lagos, on Sunday, November 5, 2017. 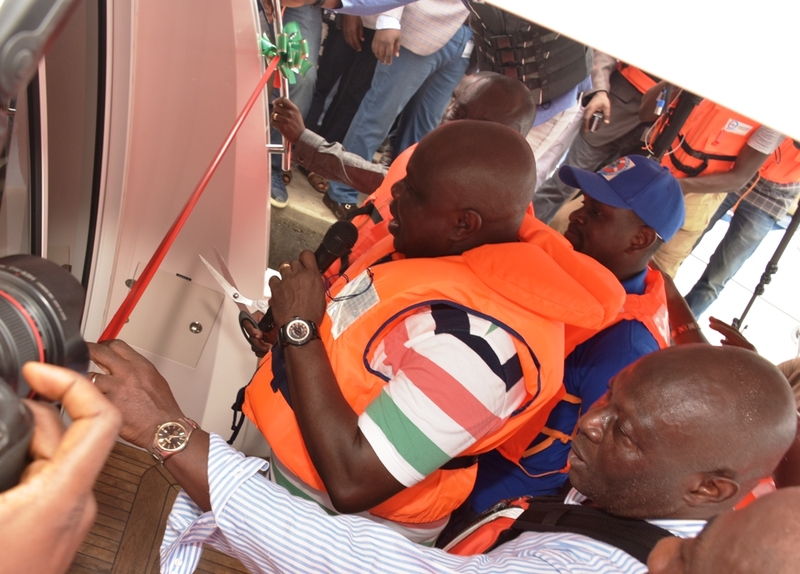 Lagos State Governor, Mr. Akinwunmi Ambode (middle), cutting the tape to commission new Executive Boats acquired by the State Government at the Caverton Jetty, Victoria Island, Lagos, on Sunday, November 5, 2017. With them are Commissioner for Water Infrastructure Development, Engr. 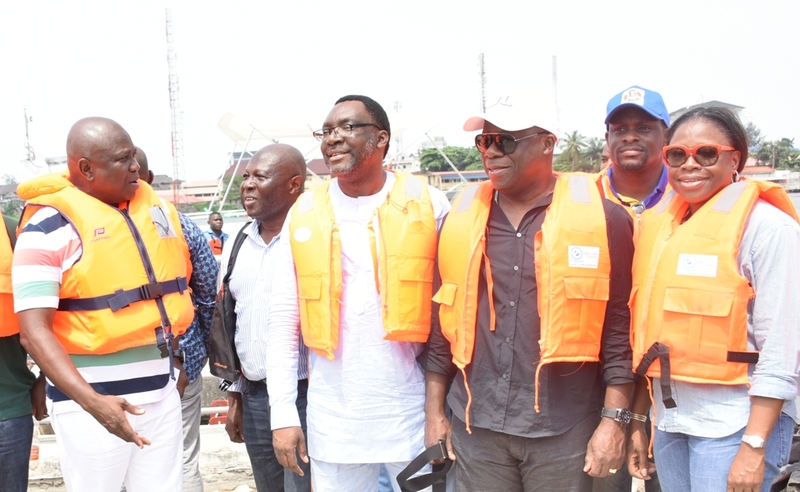 Ade Akinsanya (right); Managing Director, Lagos State Waterways Authority (LASWA), Mr. Damilola Emmanuel (middle behind) and C.E.O, Lagos Ferry Services, Mr. Paul Kalejaiye (left).